Home People Emeritus Faculty David N. Silverman, Ph.D. Box 100267 AHC, 1200 Newell Dr.
Thesis topic: Nuclear magnetic resonance of solutes in liquid crystal solvents. Postdoctoral, Cornell University, 1968-1971, with Professor Harold A. Scheraga on protein structure and folding. An image of the active site of human carbonic anhydrase II showing the inward and outward orientations of the proton shuttle His64. 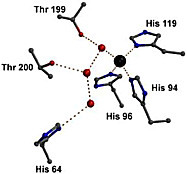 The image also shows ordered water in the active site with red spheres representing oxygen atoms and dashed lines representing presumed hydrogen bonds. The gray sphere is the zinc. 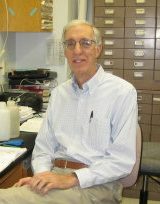 Dr. Silverman’s lab studies the catalytic mechanism of two very fast enzymes, carbonic anhydrase and superoxide dismutase. We ask what accounts for the extraordinary efficiency of these enzymes, which are able to convert the substrates carbon dioxide and superoxide to products with catalytic turnovers as great as one million per second. Both enzymes are involved in critical physiological processes. The carbonic anhydrases comprise many isoforms in humans that convert carbon dioxide into bicarbonate to form secretory fluids and in the red cells’ function during respiration. The superoxide dismutases convert superoxide, a toxic by-product of many enzymatic reactions, into hydrogen peroxide and oxygen. The active site of carbonic anhydrase II showing the orientation of the proton shuttle His 64 with respect to the zinc and its three ligands His 94, His 96, and His 119. The black sphere is zinc and the red spheres are immobilzed water molecules seen in the crystal structure. With carbonic anhydrase, our work focuses mainly on the mechanism of proton transfer in the active site. In the pathway, protons must be transferred from the zinc-bound water to solution at a rate at least as fast as a million per second. There is a proton shuttle residue, His64 in many carbonic anhydrase isozymes, that accepts a proton from the zinc-bound water through intervening hydrogen-bonded water bridges and transfers it to the solution. We have measured the rates of intramolecular proton transfer in many isozymes and site-specific mutants of carbonic anhydrase to understand what processes determine the activation barrier for this proton transfer rate. Among the possibilities are the energy to orient side chains, such as His64, and the energy to form a hydrogen-bonded water chain between the zinc and His64. This is a very good system for studying such proton transfers, and the properties of intramolecular proton transfer that we discover should be applicable to more complex systems such as bacteriorhodopsin, cytochrome c oxidase, and F0F1 ATPase, among others. Our work with manganese superoxide dismutase is, in some ways, similar to that on carbonic anhydrase to determine the pathway and rates of the proton transfers that form the product hydrogen peroxide. This enzyme has a network of hydrogen-bonded water and side chains that extend throughout the active site. Our work with site-specific mutants has determined that this network plays a critical role in these proton transfers. We are also studying the role of nearby residues on the redox potential of the manganese and how this influences the catalysis. Under many conditions, manganese superoxide dismutase is limited in rate by a product inhibition. Using a variety of methods, we are measuring the rates of formation of the inhibited complex and identifying its structure. Much of our work involves measuring the rates of very fast enzymatic reactions. We use several methods in our work on carbonic anhydrase and superoxide dismutase. Stopped-flow spectrophotometry is capable of measuring the optical properties of solutions containing enzyme and substrate after a mixing time of about 1.5 milliseconds. Our instrumentation can measure a full absorption spectrum about every millisecond after that. With superoxide dismutase, reactions are often faster than that, in which case we use pulse radiolysis which relies on an electron accelerator at the Brookhaven National Laboratory. We have also found that mass spectrometry to measure the enzyme catalyzed exchange of oxygen-18 between carbon dioxide and water is very informative for carbonic anhydrase. Through collaborations, we have projects to determine structure using x-ray diffraction and to determine the properties of the manganese using electron paramagnetic resonance, as well as studies of stabilities using scanning differential calorimetry.